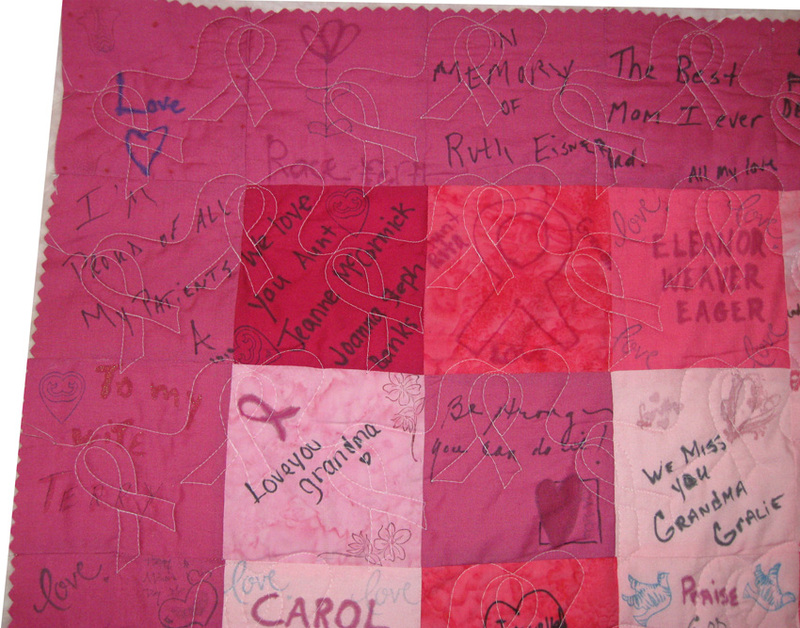 I quilted the first Breast Cancer quilt on the ProStitcher this weekend. I was able to complete it there because there were not too many bobbles added to the quilt blocks. However, I managed to hit one rhinestone with the quilt machine. Luckily, nothing seems to be damaged. After that rhinestone, I had a little bit of difficulty getting the pattern lined up again. When the ribbon should have been higher, it was lower, and vice versa. So, one band of ribbons is out of synch. You can't see it too much on the front but I know it's there (not in the photo below). Here's a section where you can see the quilting pattern that was completed. Now all it needs is the binding and it's ready to go. dont put yourself down - it looks awesome, and every one else ill see the thought and work that you put in, not the tiny error!! !